The streets of central London became a sea of RED and Green today, as Sierra Leoneans from across the UK, belonging to both the ruling APC party and the country’s opposition SLPP joined a protest march against the unconstitutional and despotic behaviour of president Koroma. But who would have thought that, an APC – SLPP alliance against lawlessness and in defence of the country’s Constitution was ever possible? Disaffected supporters of the ruling APC joined a chorus of “Koroma is a thief”, at the doorstop of Number 10 Downing Street – home of the British Prime Minister – David Cameron, where they delivered a petition calling on the British government to take tough action against the Koroma regime in retaliation to its gross violation of Sierra Leone’s Constitution. And as Sierra Leoneans enjoy their right of protest guaranteed by British justice and civil liberty, the same cannot be said of their brothers and sisters in Sierra Leone who are not only being stripped of their human rights and free speech, but stripped of their human dignity by the heavily armed security forces. Several people in Kenema were today beaten up and arrested – including the SLPP PRO and civil rights activists. Sierra Leone is now gripped by a growing sense of fear of the barbaric return to APC One Party rule, responsible for the disappearance and death of hundreds of political opponents in the 1970s and 1980s. Today, it is the same APC that is now ruling Sierra Leone – a government that has metamorphosed from a progressive forward looking party to a radical, authoritarian communist regime, propped up by the Chinese. 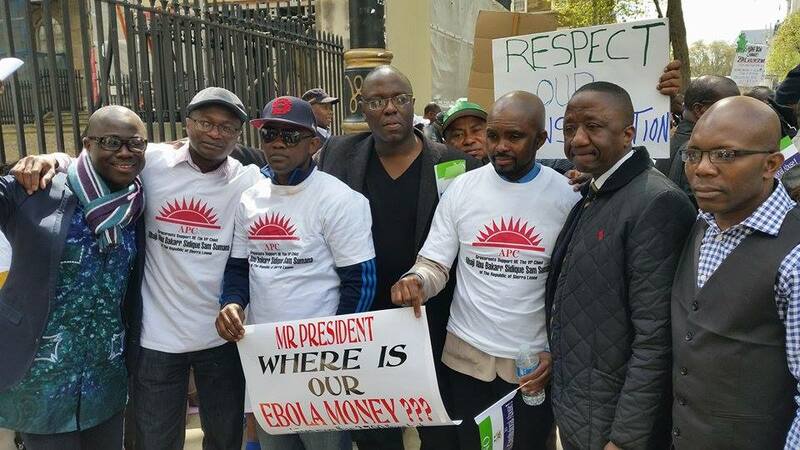 Sierra Leoneans in the United Kingdom, including many disaffected APC members have delivered a petition against President Koroma at the office of the British Prime Minister during a protest rally on Monday, 27th April, 2015, in London. Addressing the crowd during the rally, the Chairman of Sierra Leone First – Mr. Jimmy Batilo Songa, said that the purpose of the demonstration was to present a petition to the British Prime Minister David Cameron, on the concerns of Sierra Leoneans about the unconstitutional actions of President Koroma. Mr. Jimmy Songa stated that the demonstration was not about SLPP or APC, rather it was about Sierra Leoneans coming together to stand up for constitutional order and accountability for millions of stolen Ebola funds. Mr. Songa called on the British government to ensure that Sierra Leone does not revert to a failed state, where there is no respect for national constitution and accountability. Many other APC members, including both male and female wearing APC t-shirts, also addressed the crowd calling for President Koroma to respect the constitution and the rule of law. 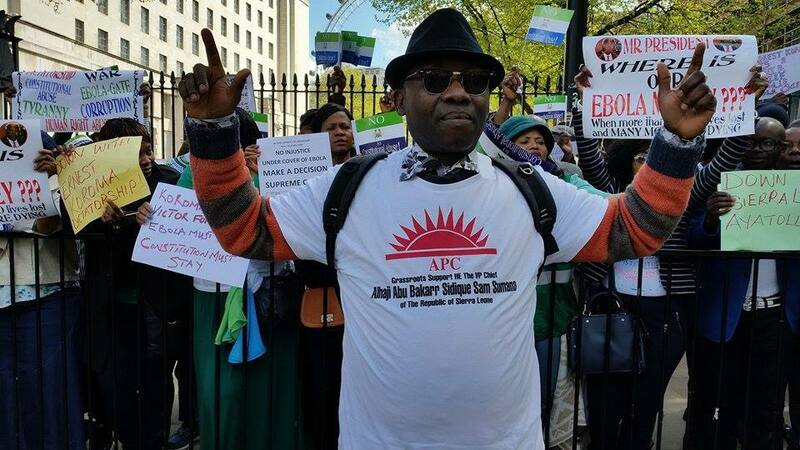 Many of the APC members who demonstrated against President Koroma had APC T-shirts with an inscription – “Grassroots Support HE The Vice President Sam Sumana of the Republic of Sierra Leone”. 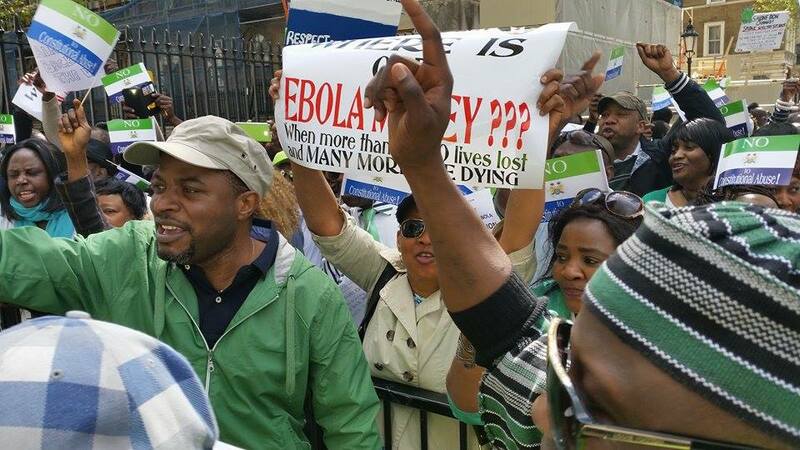 The defiant crowd chanted slogans such as “Ernest is a Thief”; “Brink back our Ebola money”. 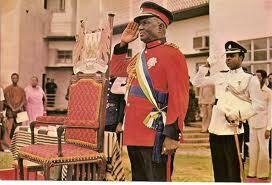 And in a direct reference to President Koroma, the crowd chanted: “Tiffy Tiffy Jankoliko”. There were also many placards showing the strong feelings of the protesters against President Koroma. Some of the placards read: “Down with Ernest Koroma Dictatorship”; “Protect our Constitution Mr. President”; “Ernest Koroma Must Go, Victor Foh Must go, Ebola Must Go, Constitution must Stay”; “Mr. 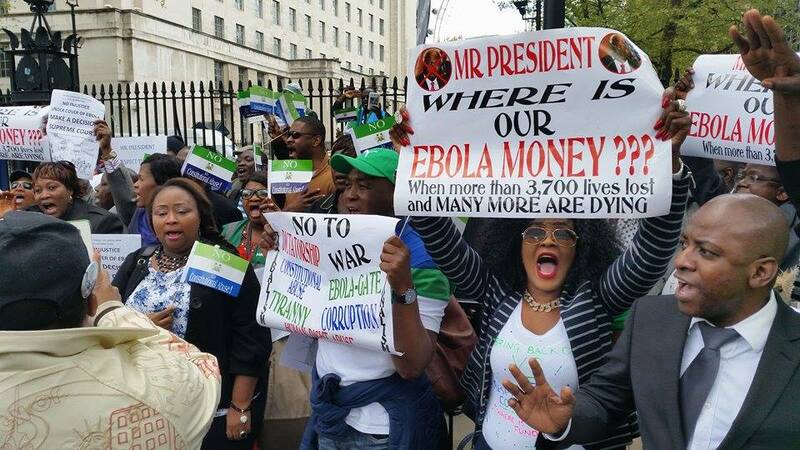 President, where is our Ebola Money”, etc. (1)That the President immediately revokes the removal of the Vice-President as he possesses no constitutional authority under the 1991 Constitution to remove the Vice-President. (2) That the President’s action has the potential to destabilise the peace and stability of Sierra Leone and of the West African region. (3) We call on the international community to condemn the action of the President unequivocally and consider travel bans for all government ministers and other key government functionaries. (4) That the President’s action is an affront to democracy, civil liberties, good governance, the rule of law and a threat to international peace and security. 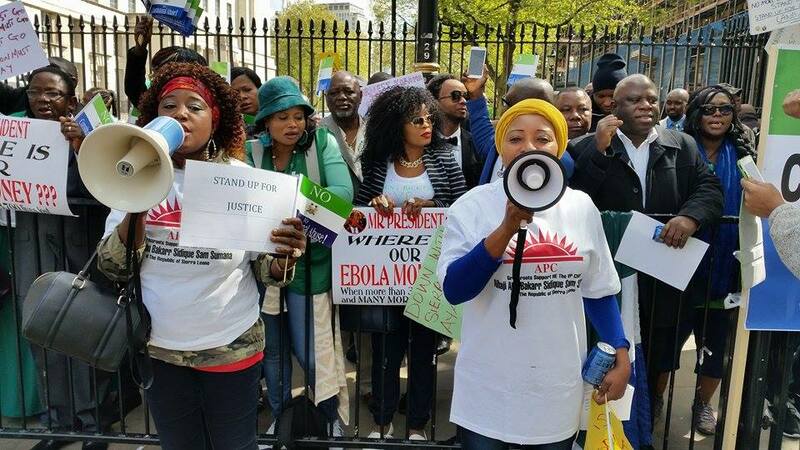 The protest marks the third protest Sierra Leoneans have embarked on in the United Kingdom against President Koroma, since his unconstitutional actions to sack Vice President Sam Sumana. And, it has also coincided with a wave of global protests taking place in the United States and Europe, as Sierra Leone marks its 54th independent anniversary. 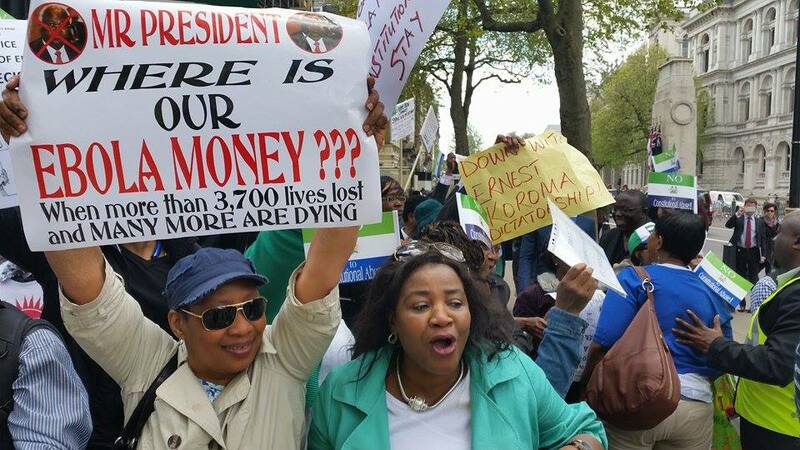 Sierra Leoneans in United Kingdom have vowed to continue to protest until constitutional order is restored. A pro-Ernest Koroma demonstration was also organised around the same location but it was a total failure, as many APC members did not attend the pro-Ernest Koroma rally. 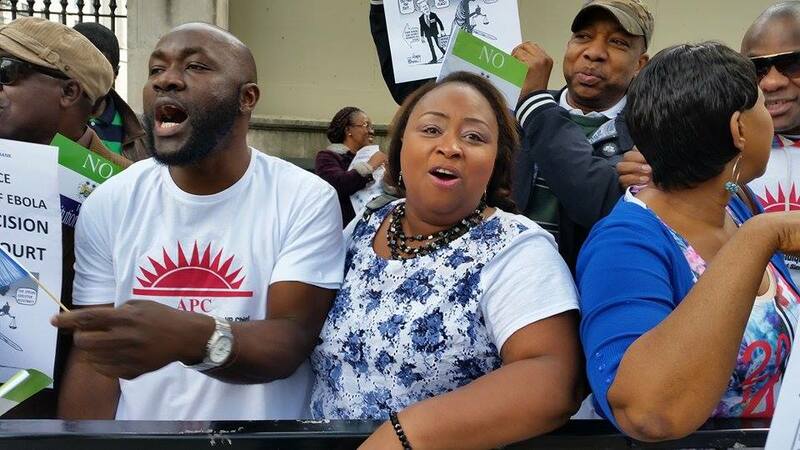 According to one of the disaffected APC members at the anti-Ernest Koroma protest rally, the APC branch in UK is deeply divided, as majority of the members are against the decision to sack Vice President Sam Sumana. As at the time of demonstration in London, it was also reported that the Sierra Leone Police in Kenema fired teargas at demonstrators for protesting against the APC government.